2018 Jeep Compass Trim Levels with Comparisons & Configurations. What 2018 Jeep Compass Trim Level Should you Buy? What is the Difference Between Trims? The Compass has been in a strange spot within the Jeep lineup, finding itself competing in the same segment as other Jeep vehicles like the Liberty, the Cherokee and, to some extent, the Renegade. But since its 2017 redesign, this model has really come into its own as a compact Jeep that is both a decent off-roader and a comfortable people carrier. It is slightly smaller and less expensive than the Cherokee, but offers a similar degree of comfort and upscale materials, while delivering a number of useful features throughout its four different trim levels. The 2018 Jeep Compass, which is unchanged from the fully redesigned 2017 version, has a generally simpler trim level design than most of the other Jeep models. It does not have a variety of different styling variants or special editions, making it easier to pick out the right trim level for your needs. It does come with a full range of optional packages though, choosing which can be as important as picking the right trim line. In this guide, we explore both the standard features and options available on the different Compass trim levels to help you build your dream compact Jeep crossover. Compare the 2018 Compass Sport vs Latitude Trims. What is the difference? Despite having one of the lowest starting prices in the segment, the base Jeep Compass Sport is relatively nicely kitted out. It comes with a full selection of basic features like power locks and windows, air conditioning and push button start, some of which are missing from the base models of some larger Jeeps. It also is fairly modern in its connectivity features: there is Bluetooth with audio streaming, two USB ports, and a 5-inch touchscreen with infotainment controls and a rearview camera. Among the options available on this model are a few interior appearance packages, an exterior appearance package that replaces the 16-inch steel wheels with alloys, a cold weather package that adds heated seats, a heated steering wheel and a windshield de-icer, and a technology package that upgrades the infotainment system to a larger 7-inch screen. That upgrade also adds support for Android Auto and Apple CarPlay, parking assist, dual-zone climate control and satellite radio. The Compass Sport is available in both front-wheel and all-wheel drive, with both available in manual or automatic transmissions. On its own, the Latitude is not a significant upgrade over the Sport. It includes 17-inch alloy wheels, a nicer interior with a combination cloth-vinyl upholstery and a leather-wrapped steering wheel, as well as roof rails. On top of that though, the Latitude has a much wider selection of packages and options. The cold weather and the technology package from the Sport return, though the latter is renamed to Popular Equipment Group. It can also be upgraded with an optional navigation system as well. There are also two active safety packages. The first - Safety and Security Group - adds blind spot monitors with cross traffic alerts, rear parking assist, rain-sensing windshield wipers, an alarm system, and a remote starter. The Advanced Safety and Lighting Group, which has the Safety and Security Group as a prerequisite, adds a forward collision warning with active braking, lane departure warning, and HID headlights with automatic high beam control. There are also a number of a la carte options for the Latitude, such as a power liftgate, power driver’s seat, a dual pane sunroof, and a sound system by Beats. It can also be ordered with the special Altitude two-tone color scheme and additional exterior styling bits. On its own, the Latitude has little to offer over the sport aside from the fancier interior design. Its many optional packages though, not only offer customization, but are also much cheaper than similar offerings on competing vehicles. The two safety packages together are listed at less than $1,500 as an example. If you are planning on getting at least one of these or other optional packages, then the Latitude is a good investment. If the improved interior trim is not important to you and you are not looking for upgrades aside from the infotainment system, then the Sport is a better value. Compare the 2018 Jeep Compass Latitude vs Limited Trim Levels. What is the difference? As the premium model of the Compass, the Limited comes with a full range of nice appearance and comfort features. It is upholstered in leather, with front seats that are power-adjustable and heated. The steering wheel is heated, and the Limited also includes 18-inch wheels and all of the features of the Latitude Popular Equipment Group package. Unlike the earlier two trim levels, the Limited is only available with an automatic transmission. It can also be loaded out with the same optional equipment as the Latitude, including the two safety packages, a power liftgate, navigation, Beats audio, and a moonroof. For the leather interior and the nicer trim on the Limited, you only pay a premium of roughly $1,000 after accounting for the all-weather package and the popular equipment package that are included in the Limited standard feature set. For most buyers, this is going to easily be worth the money, so if your choice is between a Limited or a Latitude with similar features and your budget allows it, go with the Limited. Because the Limited offers much of the same optional features as the Latitude, you are not giving up much in terms of customization either. Compare the Compass Latitude vs Trailhawk Trims. What is the difference? 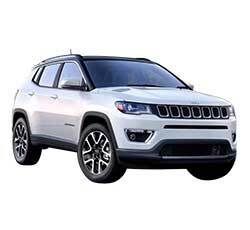 Jeeps are famous for being off-road vehicles, so it is inevitable that even the relatively mild-mannered Compass gets an off-road specialist trim level. The Trailhawk builds on the standard Latitude feature set, but instead of luxury and comfort features it instead adds off-road equipment. The Trailhawk is all-wheel drive only, and its transmission has a dedicated low-range mode with crawl functionality. It also has a raised off-road suspension, protective skid plates, and tow and recovery hardpoints. Inside, the Trailhawk is very similar to the Latitude, with the same basic equipment, though it does include the upgraded 7-inch infotainment as a standard feature. All the rest of the optional features from the Latitude are likewise available on the Trailhawk. There is also an optional Leather Interior Group that gives it a similar look to the Limited model. The Trailhawk offers an excellent low-cost alternative to the more expensive off-road Jeeps, as it is a rather competent trail vehicle. Of course, if you are a dedicated off-roader, then you may get more mileage out of the other off-road vehicles in the Jeep inventory. But for casual trips off of the beaten path, the Trailhawk is both competent and fairly nicely equipped. All four of the Jeep Compass configurations have something exciting to offer buyers. Despite its budget price point, the base Compass Sport is a nicely equipped and functional compact crossover. The Latitude offers a great degree of flexibility in terms of equipment, and the Limited offers the same in a leather-wrapped package. The Trailhawk is a decent off-road vehicle for the price, but lacks the dedicated off-roading technologies of the other Jeep vehicles. Among the best values in the lineup is the Latitude with the popular equipment and the safety packages, as it delivers all of the must-have features that are most popular among crossover SUV shoppers. The Limited with the same packages is a runner-up, as it also offers a leather upholstery at a very fair price.